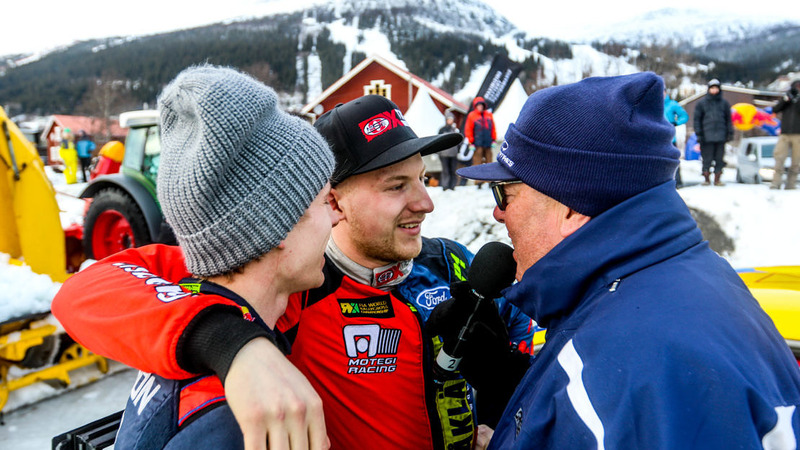 As brothers, Oliver and Kevin Eriksson have always been close, but they were arguably closer than ever today (20 March) as they duelled right to the end of the Supercar Lites final in round two of RallyX on Ice presented by Cooper Tires on Sweden’s frozen Lake Åre – with the younger of the pair ultimately prevailing by less than five hundredths-of-a-second. Quick throughout the qualifying stages, the Olsbergs MSE team-mates topped the intermediate standings – Kevin narrowly ahead of Oliver – before going on to win their respective semi-finals. That left them sitting side-by-side on the front row of the starting grid for the all-important final – with 2016 RallyX on Ice Champion Kevin on pole position – but defending title-winner Oliver was not going to give up without a fight. Adopting opposing tactics, Kevin grabbed the early lead as Oliver darted immediately for the joker. Emerging in traffic, the younger Eriksson got the hammer down and fought his way past multiple Swedish Rallycross Champion and current FIA European Rallycross contender Peter Hedström – a late addition to Wednesday’s Supercar Lites entry. Such was the 20-year-old’s pace that when Kevin took his joker on the very last lap, Oliver emerged marginally ahead – only for the greater drive out of the joker lap exit to propel Kevin alongside. As they flashed past the chequered flag, there was just 0.049 seconds between them – in Oliver’s favour. Despite only signing up to compete 24 hours earlier, Hedström rounded out the rostrum on his Supercar Lites debut. The Swede survived a half-spin in the final to cross the finish line in third place after impressing throughout the day with his pace and consistency, with Ben-Philip Gundersen – who won two of his three qualifying races – fourth. A mid-race slide for the Norwegian resulted in a hefty side-swipe from countryman Petter Leirhol, which left the latter carrying significant damage and dropping down the order, but the JC Raceteknik ace was happier with his overall form after uncharacteristically struggling for speed on the opening day. Monday’s winner Sebastian Eriksson wound up fifth after making contact with a snow bank shortly after the start, but the recent SM Veckan Swedish Winter Champion nonetheless continues to top the championship table, albeit by just a single point from Kevin Eriksson, with Oliver Eriksson a point back again in third – setting the scene for a tantalising title showdown on Saturday, when all of the action will be livestreamed on both Motorsport.tv and SBF Play. Former Junior WRC and WRC2 Champion Pontus Tidemand was one of the big names not to make the final, clashing with Oliver Eriksson on the dash to the flag in Q2 and missing out on a spot in the last six by barely a second. Alexander Westlund – championship runner-up three years ago – crashed out at the semi-final stage, while mention should go to the improving Martin Jonsson, who defied his comparative lack of experience to confidently keep experienced Supercar Lites protagonist and multiple RX2 podium-finisher Sondre Evjen at bay in semi-final two. In the supporting CrossCar category, Linda Johansson made history as the first female ever to win in RallyX on Ice with a commanding performance, leading home Max Rundberg and Ole-Henry Steinsholt, the latter doubling up this week by contesting both classes. Former FIA World Rallycross Championship star Lukács ‘Csucsu’ Kornél was on feisty form as he fought his way into third, but he was denied a podium finish by a last lap mechanical issue. Two other major contenders – Julle Ljungdahl and Isac Egonsson – hit trouble at the semi-final stage, the former finding himself squeezed into a snow bank and the latter slowing on the last lap with clutch issues, ruling them out of the scrap for honours. In Monday’s delayed final, Rundberg emerged on top from ‘Csucsu’ and Johansson.